FC Barcelona ends 2017 with a draw. They did so in a thrilling game against Palma which ended 4-4 at the tought away ground of Son Moix. It was a game which had everything with lots of goals, emotions and a sending off. The blaugranas’ ability to respond to the situation meant Joselito’s late goal ensured they went home with a point. The first half went badly for Barça as they went in to the break 2-1 down. During this opening 20 minutes the blaugranas struggled in attack with Joselito the only player able to find the back of the net to make it 1-1 in the 15th minute. Palma were more clinical and their two goals came from Quintela and Paradynski. Andreu Plaza’s team needed to respond in the second half. The balance of the game shifted somewhat and the away side started to threaten the home team. They moved the ball well and Palma started to slip up somewhat, but their goalkeeper Barrón was playing excellently for them. However, he was unable to do anything about Dyego’s equaliser which came from an excellent move in the 26th minute. 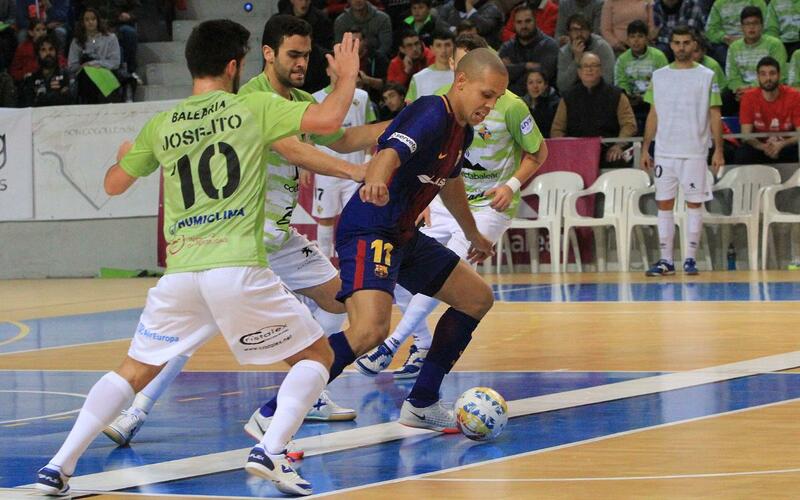 Then, Quintela scored an own goal from a set piece move from Rivillos putting Barça into a 3-2 lead. Playing away to Palma is never easy and it proved to be the case again. Their advantage didn’t last long as Eloy Rojas brought the opposition level with a fantastic free kick in the 30th minute. After Paco Sedano was sent off, Rojas again scored to make it 4-3 with three minutes to go. It looked like it was all over for the blaugranas until Joselito showed up to draw his team level. He has scored 15 goals this season and he scored his second of the night and the last in this match to make it 4-4 with a second-post finish at the death. The equaliser was a fitting end to a fabulous match which either side could have won.